MCF is developing and financing ($19,575,000 private offering) the Iron Ice film and Hat Trick lifestyle brand intellectual properties (IP) targeting the China, U.S. and global entertainment ($2.2 trillion) and sports ($1.5 trillion) markets. Disclaimer: The Sizzle Reel is for private viewing only and created to provide an idea and feel for the film story. The actors that are in the sizzle reel and listed in the documents are potential cast members and are not attached to the film project currently. 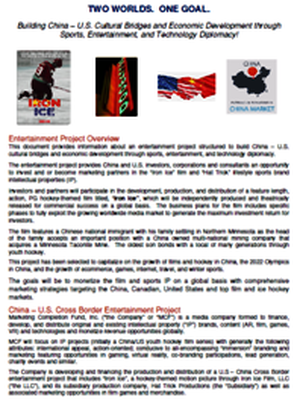 The entertainment project is capitalizing on the economic trends in China investments being made to prepare for the Beijing 2022 Winter Olympics, the growth of hockey in China, the growth of the China e-commerce, internet, film, sports and travel markets and investments that China is making in the global e-commerce, internet, film, sports, technology, and travel industries. In addition, major global brands, Hollywood studios, the NHL, sports, and technology companies are investing in the opportunities in the China e-commerce, film, internet, Olympics, sports, technology, and travel industries. The Iron Ice film project has progressed step-by-step through its planned phases and is now ready for participation by investors. A unique structure, which includes specific elements to optimize the revenue stream and to protect the investors, has been utilized for this project. 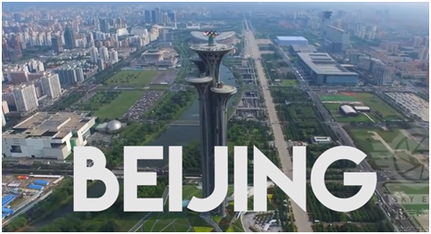 This structure involves keeping costs low, locating production in Beijing, China, and Minnesota (the city and state portrayed in the movie), and working with entertainment industry professionals in China, Hollywood, and Minnesota. The innovative structure ensures that very little of the investors’ money is spent until distribution contracts are signed guaranteeing revenue, therefore limiting investors’ downside risk. This is a very favorable structure for a multi-leveled entertainment investment. As part of its Olympic bid, President Xi Jinping and the Chinese government pledged a "three-hundred-million-person winter-sports" plan, hoping to boost its tepid participation numbers from less than 2 percent to 22 percent. Hockey, one of the most popular sports in the Winter Olympics, is a key part of that strategy. This entertainment project is structured to build China – U.S. cultural bridges and economic development through sports, entertainment, and technology diplomacy. 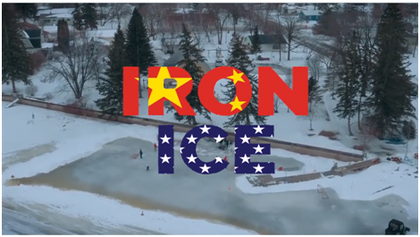 The entertainment project provides China and U.S. investors, corporations and consultants an opportunity to invest and or become marketing partners In the “Iron Ice” film and “Hat Trick” lifestyle sports brand intellectual properties (IP). Investors and partners will participate in the development, production, and distribution of a feature length, action, PG hockey-themed film titled, “Iron Ice”, which will be independently produced and theatrically released for commercial success on a global basis. The business plans for the film includes specific phases to fully exploit the growing worldwide media market to generate the maximum investment return for investors. The film features a Chinese national immigrant with his family settling in Northern Minnesota as the head of the family accepts an important position with a China owned multi-national mining company that acquires a Minnesota Taconite Mine. The oldest son bonds with a local of many generations through youth hockey. This project has been selected to capitalize on the growth of films and hockey in China, the 2022 Olympics in China, and the growth of ecommerce, games, internet, travel, and winter sports. The goals will be to monetize the film and sports IP on a global basis with comprehensive marketing strategies targeting the China, Canadian, United States and top film and ice hockey markets. ​MCF will target economic development in the following countries, states, and cities and industry sectors with the estimated capital investment. Business Summary: Marketing Completion Fund is a media investment company founded in 2017. Our vision is to apply a Financing Risk Mitigation and Marketing Technology System to reduce risks investing in new intellectual property (“IP”) ventures (e.g. Artificial Intelligence, Augmented Reality, Brands, Films, Games, MarTech, MedTech, and Virtual Reality) and monetizes revenue globally. 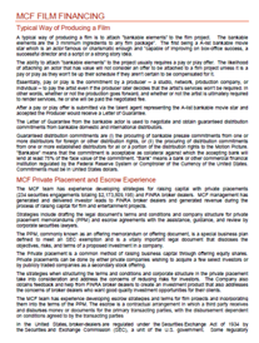 Opportunity and Protection: To protect capital investments against loss, MCF has developed a Financing Risk Mitigation System that addresses a perennial question for investors that would like to reduce risk in any new venture: namely, protection of invested capital and infusion into the venture upon proven milestone achievement. If these milestones are not met in a timely manner, then the remaining investor capital will be returned. 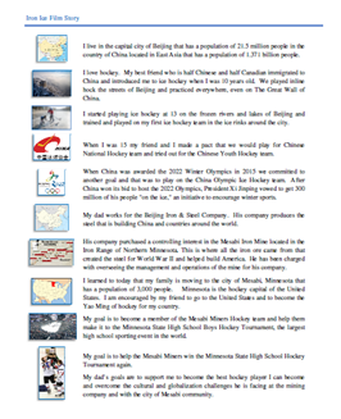 Platform/Services: The first IP venture that MCF is applying the financing and marketing system to is a China – U.S. Cross Border project that includes the Iron Ice feature length hockey film and Hat Trick lifestyle sports brand IPs. The company has projected revenues to reach $5.0 million in 30 months, $60 million in 60 months and over $300 million in 120 months from films, Ecommerce, games, AR/VR, lead generation, merchandise, celebrity charity events, and youth fund raisers. Target Markets: By 2021 China, U.S. and global Entertainment and Media ($2.2 Trillion), Retail Ecommerce Sales ($4.5 Trillion) and Sports Industry ($1.5 Trillion). 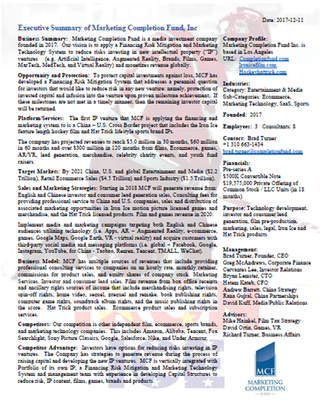 Sales and Marketing Strategies: Starting in 2018 MCF will generate revenue from: English and Chinese investor and consumer lead generation sales, Consulting fees for providing professional service to China and U.S. companies, sales and distribution of associated marketing opportunities in Iron Ice motion picture licensed games and merchandise, and the Hat Trick licensed products. Film and games revenue in 2020. Implement media and marketing campaigns targeting both English and Chinese audiences utilizing technology (i.e. Apps, AR – Augmented Reality, e-commerce, games, Google Maps, Google Earth, VR - virtual reality) and acquire customers with third-party social media and messaging platforms (i.e. global – Facebook, Google, Instagram, YouTube, for China - Taobao, Renren, Tencent, TMALL, WeChat). 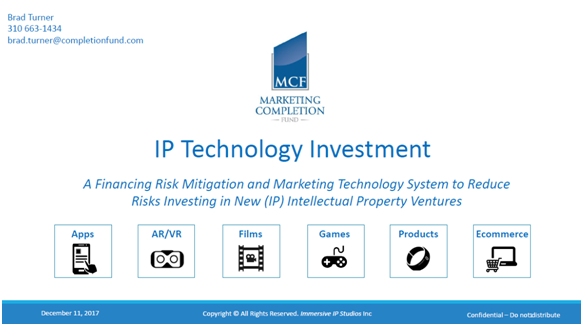 Our vision is to apply a Financing Risk Mitigation and Marketing Technology System to reduce risks investing in new intellectual property (“IP”) ventures and monetize the revenue opportunities globally. The Company has developed an investment structure to invest in motion pictures that has the potential to earn substantial returns. The film can earn revenue from box office receipts and ancillary rights sources of income. These sources include merchandising rights, television spin-off rights, home video, sequel, prequel and remake, book publishing rights, computer game rights, soundtrack album rights, and the music publishing rights in the score. The Company is raising capital and offering accredited, corporate, and institutional investors an opportunity to invest in a $500,000 seed round convertible note or in a $19,575,000 Private Offering of Common Stock / Limited Liability Units that are a combination of Marketing Completion Fund, Inc. Common Stock and Iron Ice Films, LLC Membership Units (collectively the “securities”). A Financing Risk Mitigation System that addresses a perennial question for investors that would like to reduce risk in any new venture: namely, protection of invested capital and infusion into the venture upon proven milestone achievement. If these milestones are not met in a timely manner, then the remaining investor capital will be returned. For film projects the Financing Risk Mitigation System requires specific milestones to be met before the monies invested can be released for film production and a marketing technology system designed to optimize generating revenue streams PRIOR TO PRINCIPAL PHOTOGRAPY and after theatrical and digital distribution of the film. A marketing technology system that is comprised of a grouping of technologies that improve marketing activities to simplify processes and make it easier to measure the impact of marketing channels and drive more efficient spending.